Sunday was very good indeed. I got to go and do all the things I wanted to do and mostly got everything to work out well. Beignets, oysters at ACME oyster, and a ride through the 9th Ward to see more houses, and perhaps more significantly, more people than ever before. Yay! So, yes, I had fun. It started with a pleasant surprise as a trip I thought I had to make to the airport didn't have to be made. 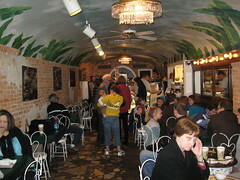 Someone else did it for me, so John and I were able to go to the Beignet Cafe for their yeast-based beignet. I love those, with the nutty chicory coffee and plenty of cream. Unlike the Cafe du Monde, they make their beignet with yeast instead of baking powder, and the taste and texture differences are amazing. I love the tender, crisp beignet at Cafe Beignet, and we sat there and each enjoyed two with our coffees before going back to the hotel. I liked people watching there as well, most of the folks were tourists, but there were a good number of local as well, with the musical nuances of their accents as they spoke about getting kids to games, a shrimp boil gathering, and other normal, every Sunday sorts of things. It was lovely and relaxed. Then, together, we packed up everything in the room, got it all into the car, checked out while there were no people in the lobby, and took the second batch of folks to the airport and came back and parked the car in the hotel garage, we had in and out privileges at the garage all day. It was exactly 10:45 a.m. when we parked. 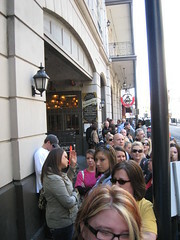 We walked over to the ACME Oyster House, and got in line. Yes, there was already a line, but only with three people in front of us, and they were marathoners who had just finished their race that morning and had showered, gotten dressed, and had gone back to the ACME Oyster House after having eaten there the day before. We'd seen a long line in front of this place all weekend, and by the time they opened at 11 a.m., the line was all the way down the block. But we were second in line, so we got window seats, and it was absolutely amazing. It's known for its oysters, and we love our raw oysters, but we'd heard so much about their chargrilled oysters that we ordered half a dozen raw, half a dozen char-grilled, and just two cups of their crab and corn soup for our lunch. The char-grilled ones are done on an open grill near the back of the restaurant with a HUGE venting fan, and they're covered with a garlic butter with other seasonings, grilled and then sprinkled with Parmesan cheese and allowed to crisp before they're served. They're cooked just enough so that they're still tender and rich with all the toppings and salt. It's lovely. And a beautiful way to introduce people to oysters, as they aren't too crazy. It's just cooked shellfish with butter, garlic, and parm, and the presentation is so good and the flavors so nice that Ryan, who had never had a raw oysters in his life, really enjoyed the grilled ones the previous day. The raw ones, though, were astonishingly good. The ones at Shaggy's had been very good as well, but the ones at the White Cap hadn't been nearly so fresh, and they felt like they'd been 'washed' in fresh water as they didn't taste quite right. Here they'd done all the right things and when the oysters showed up at our table they were good and cold, sweet and tender, and while it's odd to think of something as soft as an oyster as "crisp" it was that bite into them was good and crisp. Great oysters are that kind of "crisp" to me, where the flesh doesn't squish or ooze or any of those things most people associate with oysters, there this instant snap/firmness giving to the tooth that I love, love, love about great oysters. Plus they tasted like the sea. 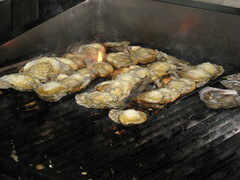 Wonderful, fresh, raw oysters taste like the bay or the ocean water they're grown in. John and I have had taster platters with six oysters, each from a different bay or inlet, and we were amazed by the differences in taste between each of them when they were beautifully transported and taken care of during their transport; and they have to be as cold as in their home waters for them to taste just right. These were wonderful. We inhaled both platters before the waitress even came around to get our order for our soup. *laughs* So we wandered the restaurant for pictures, the bathroom, and found that the restaurant was very, very narrow and deep, and they had a lot of long tables at the back that they seat family style, where lots of people share the tables. That was really cool, so they probably got most of that line into the restaurant before they were full up. And they were full up before they were done with all of the line that had formed outside. From there we went back to the hotel, did the hurry up and wait thing with all the people that were going to the airport, and then loaded up three cars with people to go drive around the Ninth Ward and the other Brad Pitt housing project just to see what was there. 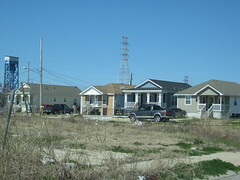 So the good news is that there are far more cute houses in the 9th Ward than there was last year. Lots and lots of them. There are some pretty amazing architectural structures along with small bunches of cute little houses like these. 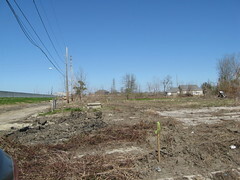 The levees have been solidified, and nearly all but two or three of the boarded up houses have been leveled and taken away. There was no more askew wreckage. There were also more people around on a Sunday morning. We actually saw a lot of kids playing around their houses, in the street, something we hadn't seen the last two years, so that was a really encouraging sign. The bad news was that some of it still looked like this. Empty fields with countless concrete pads just sitting there, waiting. One of the newer problems that they were having in the coastal regions has been the disputes over lands where the ownership is in question. Quite a few houses were just passed down from generation to generation without any paperwork being done, so there was no longer a legal, alive owner. Some of it the properties belonged to people with no heirs, others were just those of people that left without giving any information as to where they were going, and so it is getting all snarled up in a mess of who owns what and what isn't owned anymore and where does that property go? Who profits by it? It's a new problem along with the fact that insurance is expensive. In Biloxi, the insurance for one of those tiny houses is now $300 a month!! Which is more than the mortgage would have been if it were newly bought. It's amazing how expensive insurance is, and how that drives up the overall cost of living there. We drove about, found the three "Green" houses that Pitt built right by the levee on the other side, and found all three of them still for sale. They've been standing empty for three years now. I guess they were too expensive for the neighborhood? I dunno... all I know is that it seems a waste to just see them standing there, empty. It was a beautiful day, too, sunny and 60 and lovely and warm. From there we headed to the airport, where we watched the US play Canada in the hockey final as much as we could, got on the plane, and arrived to snow. We all got to the church, unhindered, and Jet met John and I in his Hawaiian outfit, just shorts and short-sleeved shirt and hugged me all the way back to the car. Poor guy. We got home and mostly just fell asleep. I am tired, I guess. Always wanted to get down there, for the food and the fun, and someday hope to still go, sorry it's still a mess. Oysters! The crab and corn soup sounded good too. You should do that!! It's getting better, and the more people that visit and spend money (laughs) the more there will be to build with. The oysters sound an absolutely splendid meal. Wow. It was wonderful and thanks for reading! !